The show kicked off with No Way Jose losing to Austin Aries via Submission. I love No Way Jose, from his explosive personality, to his movements, and his dumb theme song. He came out and led a Conga-Line around the ring with fans and proceeded to comfortably hold his own against Aries, despite many fans' assumption that Aries would ‘carry’ Jose to a good match. Since coming to NXT Aries has done nothing, and continues to do nothing to impress me. Over 3 Takeovers he has beaten Baron Corbin via Rollup after being dominated most of the match, lost to Shinsuke Nakamura and now at NXT Takeover: Brooklyn II he was dominated by Jose before making him tap out. I am not a fan of Aries, but I am a fan of Hideo Itami however, who after the match entered the ring, pulled off his suit and hit the Go To Sleep on Aries to a HUGE crowd reaction. God that was satisfying to see. Ember Moon made her NXT debut, defeating Billie Kay who honestly came out looking better to me than Ember Moon did, in terms of entrance, attire, and athleticism, Billie Kay is growing on me, which is good considering she is still an ‘Enhancement Talent’ used to take losses from people but she is showing reasons why she should be doing better. This match was… okay, if a little sloppy and underwhelming. The only high moment was Ember Moon’s entrance, where she looked like she belongs in Mortal Kombat, and her finishing move which was a very cool Top Rope spinning stunner. Next up, Bobby Roode defeated Andarade ‘Cien’ Almas in a decent match but nothing special. By god, Bobby Roode’s entire entrance was so good, and with the entire arena and myself singing out loud at my computer it just enhanced how much star power this guy has. This next match was for the NXT Tag Team Championship, which were successfully defended by The Revival as they defeated ‘D.I.Y’ the team of Tomasso Ciampa and Johnny Gargano by submission. This match was honestly match of the night, and probably my second favourite match out of the entire Summerslam weekend; only being beaten by Styles vs. Cena at Summerslam. Words cannot describe how much detail, how much emotion and how much raw talent these four men have and put on display in this match. This. Match. Ruled. By god, The Revival are the best thing in the Tag Division ANYWHERE in the world. They do so much stuff right, so much old school heel moves and tactics and they are just so clean and crisp. Then, for the NXT Women’s Championship Asuka successfully defended her title against Bayley - who as a fun little bit of trivia, is only ONE of TWO people on this match card that had a match at the last NXT Takeover: Brooklyn where she was also in a match for the NXT Women’s Title. This match was okay, but compared to her match against Sasha Banks last year (who was ringside along with Charlotte and Becky) it fell flat. This is the second time these two have faced off and to me, they just don’t seem to click, or have memorable matches or moments. The only notable thing from this match was Bayley’s standing ovation from the crowd before she left to chants of ‘Thank you Bayley’, and Corey Graves announcing "Not every story has a happy ending", as Asuka reigned victorious. Bayley would make her official debut as a ‘RAW Superstar’ the following Monday, leaving NXT behind after becoming a one-time NXT Women’s Champion. Then, for the NXT Championship; Shunsuke Nakamura defeated the champion Samoa Joe to become the 9th holder of the title in a superb match, if a little slow - going for over 20 minuets. Violinist Lee England, Jr came out to play Nakamura’s theme song and it left chills down my spine, everything about this entrance was amazing, fitted Nakamura and made him look like a million bucks. Nakamura kicked out of a Muscle Buster, which is a surprise as it has been well protected, but really helped sell this big match feel, the only thing that was more of a shock was Samoa Joe kicking out of the ‘Kinshasa’ knee strike that has put away every single opponent it has been used on in the WWE. It took a second Kinshasa to put away Joe. 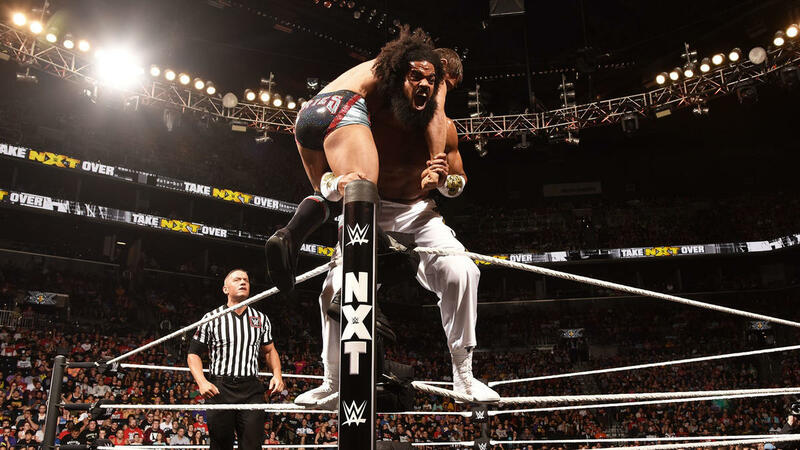 Joe’s time in NXT has been…. Well, uneventful. He’s feuded with a few people and come out looking good, however his last few months have sucked. He feuded with Finn Balor for like, EIGHT MONTHS over the NXT Title, where he lost at two Takeovers, then won the title on a house show, defended it once against Balor and then lost it now to Nakamura? His reign as champ is easily one of the lowest in recent NXT History. Overall, NXT Takeover: Brooklyn was a solid show, and blew Summerslam out of the water like most people expected. The fans love the product, the wrestling is great, and the storylines characters continue to be more flushed out and enticing than most of the Main Roster, and the entrances here in NXT make people look a thousand times better and feel more important. Comparing it to last years NXT Takeover in Brooklyn… well, let’s just say the first one put the scale pretty high and even though it may not have been better, it’s still a solid show worth the $9.99.